Are you ready? You are going to need an updated resume, a winning cover letter, and in some situations a portfolio of samples of work. You will also need to know how to use your contacts to tap into that hidden job market. This step will provide you with information and activities to really make you stand out. Sometimes people look at the job ads in newspapers or online. They look at the wages and think “I could do that!” However, employers hire people who have the right skills and experience. And they hire people who can show they are good workers. Refer to Succeed in the Workplace at the end of this section for tips and ideas to help you become a good employee. There are many ways to use your skills and interests in your work. If you don’t know your skills and interests, look at Step 1: Assess Yourself. 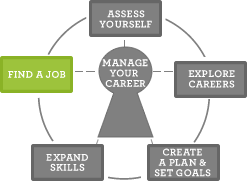 JVS provides services to assist job seekers. You can learn more about these services, and look for job postings. If you are in college, go to your college career center. Your library may also have ways to help you look for a job. Most people can do several types of jobs. Employers want to know why you would be a good worker for their job. Spend some time learning about the skills needed for the types of jobs you can do. Print out and keep track using the Job Search Target (pdf). Write down the occupations you are interested and qualified to do, the industries you are interested in, and any employers that you are interested in working for. Using the Job Search Target (pdf) to keep you on track in your job search. What you need to know about the Hiring Process.